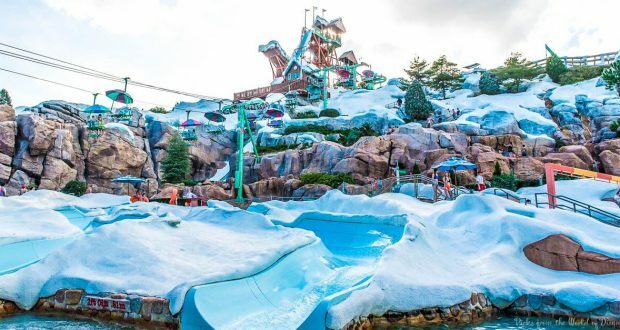 Opened in 1995, Disney’s Blizzard Beach is 66 acres of thrilling water attractions housing 17 water slides, 8 food and snack counters and Ice Gator, a blue alligator with a love of the snowy slopes. In the Florida heat, there’s nothing better than a chance to cool off at Disney’s largest water park. While there are so many things to try, here are the five best attractions at Blizzard Beach. This family white-water raft ride is the world’s longest at just over 1,200 feet. Each raft holds 4-6 people so smaller groups will be asked to team up with other guests. There are waterfalls to traverse as well as twists and turns that keep you in suspense as the raft swings up the sides of the flume. There’s no way to know how much the raft will rotate and who in your group is going to get splashed the most on the way down. The speed combined with the rotation of the raft make for an exhilarating drop at the end of the ride. Try different combinations of kids and adults to see what makes the raft faster and what gives a wilder ride down the flume. For a change of pace, the Cross Country Creek is a great way to lounge in a tube as the gentle current of the creek takes you around the park. You can enter or exit the creek at any one of the 7 landings around the park, so it’s a great way to travel to your next attraction while enjoying the ride there. The 3,000 foot journey is home to green forests and overhead bridges as well as polar caves, so be on the lookout for the spring water that falls from Mount Gushmore as it’s sure to be invigorating. Bubbling geysers and leaky pipes also help to cool you down, but try not to catch Ice Gator’s cold as you pass by his house – his sneezes can be pretty intense! From a slow pace to a fast one, the Downhill Double Dipper is a pair of side-by-side racing slides. Both slides are identical to one another and are ideal for racing down to the bottom. Each competitor gets a tube and sets up at the retractable starting gate. Once you and your fellow racer are in position and the raceway is clear, the gates retract and you drop down 50 feet at just over 25 mph. The first half of the slide is covered so you won’t know how fast your competitor is going until you emerge into the light. Once you hit the bottom splash pool, your time is displayed overhead on a digital stop clock to compare your time with your competitors time, down to the hundredths of a second. The three tube slides of Runoff Rapids are all unique. Each one has different twists and turns, but the one thing they do have in common is the speed. The two outer slides allow 1 and 2-person tubes to zoom down and around the course, turning in and out around the center slide. Fast drops keep your tube moving quickly and the tight turns mean that, with momentum, you’re carried high up the side of the slide before rocketing out of the turn to continue the excitement. The center slide is fully enclosed except for tiny pinholes of light coming in. There’s no way of knowing when the turns are coming but it’s the drops in the dark that really catch you by surprise. While the center slide is typically the most popular, each one is fast-paced and thrilling to keep you coming back to try them again and again. The number one attraction at Blizzard Beach is actually a tag-team of body slides that both start atop Mount Gushmore. The Slush Gusher has three drops that allow you to pick up speed and grab some air time on the last drop. The speed of the water carrying you down the slide is met by the speed of the water splashing over top of you as you speed down this 90 foot slide at up to 50 mph. Summit Plummet is the iconic slide of the park. It dominates the skyline, standing a whopping 120 feet tall. Looking out from the top, you can see the Tower of Terror in the distance and the rest of Blizzard Beach below you. Hold onto your hats and glasses (or better yet, don’t take them with you) as this slide will have you reaching speeds of up to 60 mph. The 360 feet of slide go by in the blink of an eye as you plummet 12 stories. Your top speed is displayed once you reach the bottom, but you’re probably already going back to try it again. These two slides are perfect for thrill seekers and are an easy pick for the top attractions at Blizzard Beach.